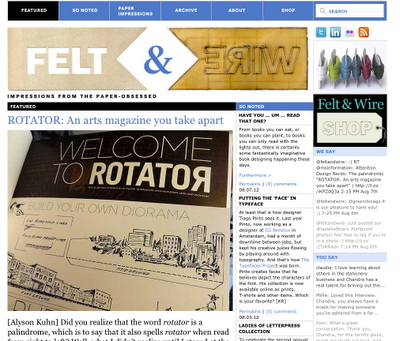 Felt and Wire, one of the nation's leading design blogs, has done a lovely feature on Rotator Magazine. It's a long, lovely piece that does a great job capturing both the purpose and the process of this beast. And it's jammed with some great photos. An encouraging word from Penguin Books!